In 2007 we exposed how TV shows were ripping off the public to the tune of millions of pounds a year by getting them to enter phone-in competitions they couldn't win. 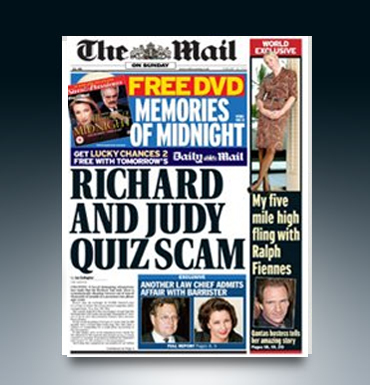 In a series of articles- sold to use by insiders- we revealed how shows such as I'm A Celebrity, Richard and Judy and GMTV were all profiting from this scam. We launched the first story with an exclusive front page story about the Richard and Judy show for which the anonymous source received a very handsome fee.